First Efforts in Beading – Lots of items for gifting! In December 2010 we spent almost a month at the North Ranch Escapee Park between Congress and Wickenburg AZ. What a great bunch of people at that park! Not long after our arrival I was invited to join a very active beading group that meets twice a week. I was immediately put to work learning my first stitches and in a couple of days had completed my first bracelet. By Christmas I had completed about a dozen, and after setting aside one of each design, I gifted a bracelet of choice to each of the female family members who joined us for Christmas dinner in Phoenix. 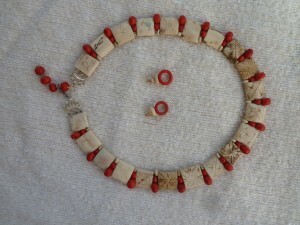 In January 2011, a visit to Quartzsite sent me browsing through the huge buildings of bead supplies and I started to make bone native inspired necklace and earring sets. Again some gifting took place but I started to build an inventory towards a future craft show. During the summer I dug out a stash of discarded jewelry and spent a couple of days breaking down multi-strand bead necklaces into additions to my stash. 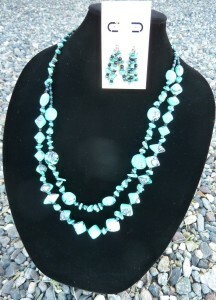 Of course I had to experiment with using some of these beads and loved the resulting ‘updated’ necklace and earrings. There will be more of this in the future. We traveled so extensively it was not beading time over the past few months! 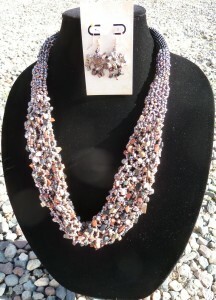 In late August, I completed a double spiral necklace …………….. 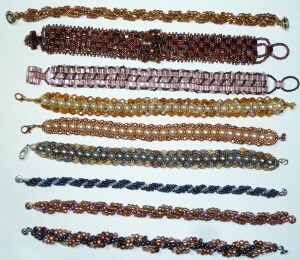 In August I discovered the Beading Daily first Bead Along and decided to give bead netting a try. Again I loved the result! This one’s definitely a keeper! 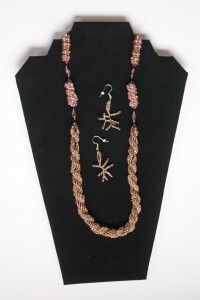 January 2012 brought us back to North Ranch and the Beading group for a visit. 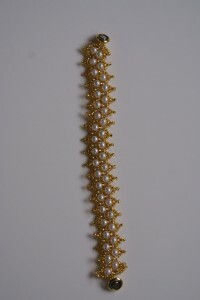 This time I did a repair job on my netted necklace – I think it was damaged when shutting a too-full drawer! But it wasn’t lost time because I was invited to a polymer clay group meeting the next day. What fun! I actually created some beads that I used in yet another necklace. Making beads could be addictive. I’ve even invested in a couple of books…..more weight in the RV! Oh MY what AWESOME beading you have been doing! And, is that one of your pieces on the header? Its AWESOME as well. I’m adding your blog to my Google Reader. All my work! More to come! Any suggestions for the web site? This is going to be a growing and learning process….